This was sent to me today. I thought it was a wonderful reminder on how people can need us even though they may not show it or ask for our assistance. When I worked in nursing homes, I usually worked eleven at night until seven in the morning because that is the time when the patients need comforting the most. I had to make bed check every two hours and when I found someone who was awake and upset, I would stay as long as possible and talk to the patient. As badly as I disliked leaving them, I had to go on to the next patient so I would kiss them and tuck them in like we would tuck in a little child. One night, a patient put on her call light who very rarely called for any help. When I went to her room and asked her how I could help her, she said something to me that penetrated deep into my heart and I have never forgotten it. She said “Why don’t you kiss me and tuck me in too”? I just looked at her as my heart broke and told her that I was sorry. The reason I had not tucked her in is because she appeared to never need anything or anyone. She was always smiling even in the middle of the night. O dear friends, sometimes the most devastating heartaches are hidden behind a smile. Joyce Landorf, an author and speaker, says on one of her teaching tapes “The people you sit next to in church may look fine and darling, but inside they are hurting”. It is important that we smile and spread the love of Jesus to all people, but it is also vital that we be honest with our emotions. Jesus is honest with His emotions. He has told us how it hurts Him when we treat each other with criticism and sarcasm. Let’s tuck people in with the love of Jesus. I just read this "Angel in the Waters" online and it is amazing. It tells the story of a baby growing in utero with his guardian angel right beside him. It shows how a baby develops in the womb and then comes to be born. It is being marketed as a Pro-Life Book which it certainly is, but it also a great story for children about how their guardian angel is always with them. Read it online at http://www.angelinthewaters.com/ or buy a copy for your favorite child today. Jesus has told us that the road to heaven is not easy. Yet we are not left to wander aimlessly in the desert. We have a roadmap. Through scripture, the teachings of the Church, and our own prayer we can follow Him through that narrow gate and ultimately rejoice in eternal life. At various times in my life, people have asked me why I pray. Honestly, I can't imagine life without prayer. My day is not complete and certainly does not go well if I have not checked in with God. God is my well. Only He has the blueprints of what I am supposed to be doing with my day. He also created my children which means that only He holds the key to understanding them. I wouldn't want to try to bring them up without God's assistance. Why Pray? Because prayer is the key to a fuller relationship with the One who knows us and loves us more than any other. New Watercolor - "The Open Door"
This is my latest watercolor. "The Open Door" is an image of part of Stanley Park in nearby Westfield, MA. I don't have much experience with landscapes, but I am trying to experiment a bit. The only way to learn new things is to try! Five-year-old David had his last T-ball game for this year today. The season ended pretty much as it started, with us sitting in the rain watching him play and his complaining about having to play in the rain! David has learned quite a bit this season about baseball, as have all the members of his team. They have come a long way since the first practice when many were not even sure where the bases were! David is not a natural athlete, but he has made progress and I am proud of him for that. Sports are such a part of our culture. It is just expected that little boys will play organized sports (little girls, too, although many might do dance instead). I was actually late starting David at age 5. Most of my friend's kids starting playing soccer at age 4! My first experience playing an organized sport was when I was nine and my parents put me on a softball team. I enjoyed playing softball until I played on my high school J.V. team and it really wasn't much fun anymore. It wasn't until I took up tennis when I was fifteen that I truly found a sport I loved. Inspired by watching Wimbledon, I asked my father if I could get a tennis racket and learn to play. My Dad (who was nearing fifty years old at the time) and I went to a local discount store, picked up some inexpensive rackets, a container of balls, and went to the library to pick up a couple of books on how to play. For me, it was love at first swing. There was an old worn out court in a nearby park - there was grass growing out of the cracks and it didn't even have a net, but every day after he got home from work, my Dad and I would go out there and practice. When he thought we wouldn't embarrass ourselves too badly, we actually moved onto a public court that had a net! I made it my goal to try out for my high school tennis team. I was so nervous showing up for that first meeting. After all, I was a junior and had only been playing for a few months. Much to my surprise, the team took anyone who wanted to be on it! The coaches were wonderful and I worked so hard. I played second doubles that first year and second singles my senior year. I didn't win many matches but I loved every minute of it. I was so proud of my tennis jacket and the varsity letter that I earned. I want my boys to someday have that sense of pride and joy playing sports, or doing any activity that they want for that matter. I don't want David or Isaac to play sports because it is expected of them, but because they want to. Just today, David was begging to sign up for soccer for this fall. I'm trying to introduce he and Isaac to any sport they show an interest in, in the hopes that they might find something that they love. Maybe they won't find their passion for a while. And maybe as they search, I, too, will need to learn something new and risk embarassing myself as my father did all those years ago. In the meantime, I hope that they will learn good lessons, like sticking with a sport for a season because you signed up for it and your team is counting on you, even when it is raining and you don't want to be there! I met with my new spiritual director for the first time today. I really like her! My past two directors have helped me immensely over the past three years, but this is my first time with someone who is a mom (and a grandmother!) and can really understand that experience. We were swapping stories about life with a three-year-old as she is helping to care for her three-year-old granddaughter. Today was really just a getting to know you kind of meeting, but hopefully this will be a beneficial relationship. God always sends you the people you need when you need them! I just checked out Kathryn Mulderink's blog at http://www.kathryntherese.blogspot.com/. She is such a talented writer. I have reviewed her books on my website: To Sing You Must Exhale and His Suffering and Ours. Visit her blog for more frequent examples of her poetry and inspiration. 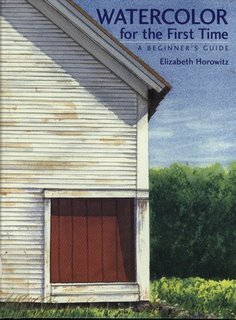 I picked up "Watercolor for the First Time: A Beginner's Guide" by Elizabeth Horowitz at the library last weekend. I am trying to get back into painting after a few years away and thought the refresher would do me good. 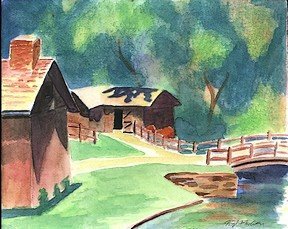 I am also preparing for a "Watercolor and Spirituality" workshop that I am giving this fall and was looking for some good ideas. What a good book! 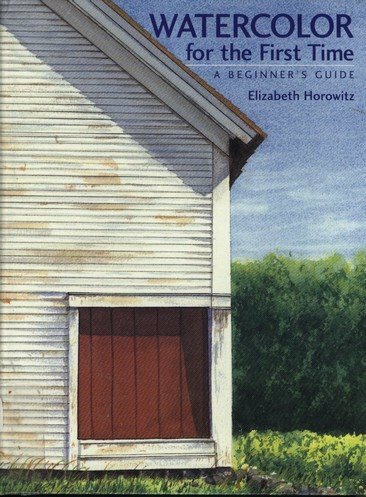 Unlike most painting books which encourage slavish imitation, Horowitz encourages watercolorists to use their own decision-making skills and to experiment. She offers techniques and examples of the tehniques being used in her own and her students' paintings, but they are all just a starting point. The paintings that are used as illustrations are beautiful. Horowitz is a talented artist as are her students. One unique aspect of Horowitz' work is her versatility. She is equally talented at creating landscapes as still-lifes. Her writing style and instructions are easy to understand. While this book is aimed at beginners, I found it very helpful even as an experienced painter and learned a few new techniques in the process. In addition, the book is in a spiral-bound format which makes it easy to lay it out on your painting table and use it while you work. It has been so hot the past couple days. The boys and I had been pretty much avoiding the outdoors except for early in the morning and late in the evening. Today promised to be a little bit cooler and I wanted to go for a walk so the boys and I set out mid-morning. We stopped at the bank and Staples en route to our final destination - the park. Despite the meteorologist's predictions, however, it was still very very hot. The boys couldn't go on the slides. It was too warm to run around. All they could really do was sit in the swings and have me push them. After about an hour there, we headed home and I promised them we could stop at the ice cream shop on the way. As soon as we placed our order, I could hear the rumbles of thunder. Still about 1/2 mile away from home, I decided to wait out the storm at the shop (Thankfully they have a small area of indoor seating). It was a wise decision. The lightning kept striking, the thunder kept booming, and the rain and hail poured down with a vengeance. The boys and I just sat on stools and watched nature put on the show. It was about an hour before we could step out into the flooded streets to walk home. The air was so cool then - so wonderful to feel after the stagnant air of the past couple days. I actually got caught in a second hail storm tonight as I was driving home from my part-time job! 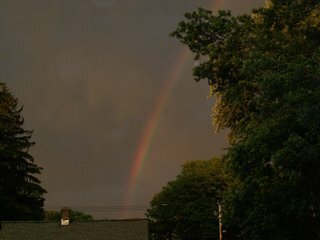 When I got home, though, this beautiful rainbow was in the twilight sky, a reminder that God's promise is still with us. Three-and-a-half-year-old Isaac has never enjoyed going to Church. He views Sundays with a dread most adults reserve for root canals. When he was two he used to throw himself on the floor and start screaming before we would even leave the house. We would try to not tell him where we would going, but he knew the way and as soon as he saw we were going there, the screaming would begin. I would spend my time at mass with him in the crying room. Sometimes, I could entertain him a bit with a book or a toy. Once he was three, however, he calmed down a bit and I told him he was a "big boy" now and needed to sit in the main part of the Church with Daddy and his 5 year-old brother David. We go to the Children's Mass (thank goodness!) where absolute silence isn't essential - just a willingness to stay in the pew and be reasonably well behaved. To date, we had survived there. Generally, he will sit with the missalette, pretend he is reading and tell himself stories which usually have nothing to do with anything going on at mass, and periodically ask "When will this be done?." Today, however, he threw a temper tantrum worthy of the most terrible two! He just wouldn't sit still and wouldn't cooperate at all. Everytime I picked him up to move him or to tell him to be quiet, he would scream out "Let me go! You are hurting me!" I told him that if I had to take him out of Church he would not get to play Solitaire the rest of the day (his favorite game) and he would not get a "Pop-Tart" for a snack which is what he was trying to argue with David about in Church. (Yes, I know you are not supposed to use food as a reward or punishment but sometimes, especially with Isaac, this is all that works.) Well, he would not quiet down and I had to take him out. He proceeded to throw himself on the ground outside and wail for the next twenty minutes because he had lost his "Pop-Tart." Thankfully, I had already planned to go to the 5:30 mass this evening because I was scheduled to lector, so I wasn't upset about missing mass. I just stood there and let him scream. When David and my husband came out of Church, we took him to the car where he continued to cry on the way home, until finally he went through the door, took off his socks and shoes, grabbed his security blanket, laid down on the couch and went to sleep. After that experience, I wished that I could have done the same. I have never figured out the secret for having my children behave in Church. I even pray for them to behave in Church, along with praying that they sleep all night so that I am not exhausted, and that they both use the potty all the time when they need to! (Yes, I do take even mundane things such as this to God in prayer!) They are two busy boys who do not like to sit still. With David it mostly just took time. After he was four, he began to act better and now he does fairly well. I hope the same will be true of Isaac. Putting children on a time-out in Church doesn't work because the screaming that generally accompanies it isn't appropriate there. Taking them out of Church seems to be just reinforcing the behavior because what they really want is to not be there. Besides, I want to be at Church. So, I do what I did today and take away a privilege if they don't behave. Maybe Isaac learned a lesson today - Maybe by tomorrow he will have completely forgotten. When we were saying prayers tonight, he did tell God he was sorry for having an "attitude" today. In any case, next Sunday is another day for us. Please say a prayer that we all survive! I went out for a walk this evening after the boys were in bed. It was a beautiful evening and I needed to clear my head as well as pick up a couple things at the store. These evenings where the sun doesn't set until 8:30 won't last much longer! I walked by a couple people chatting on their respective cell phones. I think it is great for people to talk to their friends. It is wonderful to be connected to people and to multitask and get your exercise while you talk. Yet, maybe we are a little too connected. Walks are wonderful opportunities to quiet your soul and commune with nature. You can think things through while you walk, and maybe say a prayer and listen for an answer. If you have a phone stuck to your ear, you don't have that quiet. I think that is an opportunity lost. David and I reached another milestone in our relationship today. He told me that he wished I wasn't his mother. I told him that was Ok - there were many times when I was little I wished that his memere wasn't my mother either but now I am glad that she was. Parenting was never meant to be a popularity contest. If your children like you all the time you are probably not doing a very good job. My offense today - I had made him clean his room! list for daily inspiration, please send her an email at joannelowe8@cox.net. the time of figs was not yet." especially when it comes to prayers. We want God to answer our prayers now. Sometimes, He has to tell us to wait because it is not in His timing for us. We should pray before we make any big decisions like moving or changing jobs. us so much that He sent His only Son to die for us. Him because we want to love Him, not because He makes us. Loving Father and only wants the best for you. Peggy Weber is one of my favorite writers. She writes a "Spun from the Web" column about her family and life for "The Catholic Observer," our local Diocesan newspaper. I have never met her but people who know both of us say that I remind them of her - I consider that a complement. If she ever decides to step down, I would love to take over her column! In this past week's column which you can read here she was discussing how she had packed her last school lunch. Her youngest daughter just graduated from high school (as valedictorian, I might add!) I remember reading her column back when little Elizabeth was starting school. Now, I am getting ready to reach that same milestone myself. I took David to get his school uniforms today. $193 later (I'm still experiencing sticker shock from that one) he is all set for the year - both for class and gym. Uniforms have come a long way since I was in school where I owned two jumpers and two shirts. David can wear navy blue shorts in Sept, Oct, May and June if it is warm. He has his regular dress pants, both short-sleeve and long-sleeve light blue polo shirts, a pullover sweater for winter, gym sweats and t-shirt and short set. He does look very grown-up in all of it. He's so worried about going to school. He says he doesn't want to go. I told him that now that he has his uniforms he has to - he said that he wished today had never come! I keep telling him that he will be fine and have a wonderful time, but inside I'm not so sure and try as I might to hide it, I think that he senses it. Tonight I went to my first school-related meeting. I am a new member of the technology committee. I've also just been elected to the Parish Council at our church. I feel so over my head, so out of my element, so like a fish out of water. I'm sure it will all work out fine. Somehow, both David and I will get through this major transition in our lives. One of the challenges of having a graduate degree in theology is that at any given moment, someone may ask me about a truth of the faith or the reason for some religious tradition. Like anyone in any other discipline, I have my area of specialty and a nodding acquaintance with general principles in other areas. Yet with theology there is this added dimension – a question is an opportunity to minister. This person may have struggled with a problem for years and may never ask about it again. So, I do the best I can at the spur of the moment and refer the person to other experts if they are open to it. Sometimes, I confess, I am winging it, and hopefully the Holy Spirit is there, guiding my words. Just the other day I was out at dinner with some members of my family who were visiting from a long distance. The subject of tithing came up. Apparently a few days before, my mother had told them that tithing was in the Bible and they were checking with me to see if this was true. I told them it was. Now, I am not a Biblical scholar. I took two classes in scripture as an undergraduate! I only started reading my Bible on a daily basis (I do the daily lectionary readings) about a year ago. The only reason that I knew that tithing was in the Bible was because I had read it in the children’s Bible that I read to my kids every night! They asked me for chapter and verse. I told them I thought that it was in Exodus. I was wrong. The passage I had read was actually in the book of Malachi. They were still incredulous and decided it was a racket instituted by the Church to make money. I feel fairly confident that no one will increase their charitable giving on the basis of what I said. Anyway, I decided to do more research on the subject as it is a matter that I have been considering as well. In the interest of full disclosure, I have never tithed. The only time I have come close is when I get some unexpected money. I will generally turn around and give 10% to some worthy organization as a way of saying “thank you”. As for our regular income, I have always tried to give what I felt we could. At times that has been comparatively little. One practice I have always done, however, is to write the check to the Church first every week when I sit down to pay the bills. I always wanted it to come out of our “first fruits” as opposed to what was left over. Yet, at various times I have received literature (none of it from my Church) and heard people speak on the blessings of tithing – that if you give the first 10% to God, He will help the other 90% go farther. It is seen as a matter of trust in God. We trust that He will provide for us. While I have never had the nerve to give the full 10%, in a seemingly counter-intuitive move at the times in life when my husband and I have been most financially strapped, I have chosen to increase our giving. I have to say that my experience has bared the above testimony out. At those times, the light has always shown through the darkness and we have been able to get out of our financial difficulty. Perhaps it would have happened anyway, but I do think that God had something to do with it. It is often those times when you feel like you have done all you can and still aren’t getting anywhere that you most need to trust in God. It seems that for Christians, tithing certainly has not been ruled out. After all, Jesus didn’t tell the Jewish people that they did not need to tithe, and he held up as an example the widow who gave all that she had to the treasury (Mark 13:42). Neither has tithing been mandated. It is far more important that we give what we give with a cheerful heart. We should give because it is the right thing to do to help support our Church and the poor. The question of how much to give has been left to each person to decide. Regardless of the amount, it should be a gift from the heart in thanksgiving to a God who gives us so much. I had two wonderful moments today. It has been so cool here lately - not summerlike at all. Today it felt more like October. The wind was whipping which made it a wonderful day for kite flying. My father had given the boys a kite a few weeks ago. We've tried to use it a few times, but it just hasn't been windy enough. Today was perfect. Bernie and I took turns running down the streets with it with the boys running behind. All of us were laughing and just enjoying the moment so much! It was great. Every night I say prayers with the boys. It is only about 10 minutes - we thank God for our day, ask God to protect us while we are sleeping, say "sorry" for anything we did wrong, say one "Our Father," "Hail Mary," or "Glory Be" and then read a short Bible story from their children's Bible. Some nights it is such a struggle just to get them to do this. Tonight, however, they both wanted to try to say a decade of the rosary. Both of them sat there, rosaries in hand, following the beads, saying their prayers so reverently - one "Our Father", ten "Hail Marys" and one "Glory Be." I was so happy! I hope that they will continue to be willing to say one decade every day. When I was little, my mom had me say one decade a day for each grade of school I was in, and I have every intention of doing that with them as well. That way by the time they are 10, they will be saying the whole thing every day. The Rosary is such a powerful prayer. I want them to get in the habit of making it part of their lives. I just posted a new book review of de-coding Mary Magdalene by Amy Welborn. This is a great book for anyone wanting to know more about who the real Mary Magdalene was. I read an article today by Richard Cohen on "Silence both challenges, erodes faith." He was writing on Pope Benedict's visit to Auschwitz. He was asking the same question that many have asked since World War II, and indeed the same question that Pope Benedict asked: "Why, Lord, did you remain silent? How could you tolerate all this?" Cohen makes the argument that he doesn't even believe that God was there. He doesn't understand how anyone could experience Auschwitz and still believe in God. It reminded me of a story (I do not know the degree of truth) I was told in graduate school where we pondered this problem. After World War II, a group of Rabbis put God on trial for the crimes committed in the concentration camps. After finding God guilty as charged, they went and said their evening prayers. Without God, life is absurd. Our very existence is dependent upon God. As inexplicable as Auschwitz is in light of God, everything is inexplicable without God. We must not, if we are to be spiritual people, fail to realize that life is meant to be nothing but a growing ground in God. If we fail to cultivate that part of us that is our truest self, how can the self come to full life in us? The spiritual life is the discovery of the self God meant us to be so that who we are can be God's gift to the rest of the world. I was in a local drugstore recently and I couldn't help but notice the rows and rows of cosmetics. We are all so desperate to look our best. I confess, I am not immune to that tendency. I honestly do try to look presentable. I comb my hair and wear some light make-up. (There are those who would most likely say that I could use a lot more!) We are willing to spend our hard-earned money for the latest cosmetic guaranteed to make our eyes brighter, our lips fuller, our wrinkles less noticeable, and our cheekbones more defined. We are willing to spend time getting manicures and pedicures. Yet, many claim that they don't have time to pray! Do you think that perhaps we should spend less time worrying about our outward appearance which, despite all our efforts, will cease to exist at death, and more time worrying about the state of our soul which will last for all eternity? My children own a easy-to-use film camera. Every now and then I let them go wild taking pictures. It is always a surprise to see what comes out when the film is developed. Today we were putting some of their pictures into a photo album for them to keep - this was after I refused their request to put all 100+ pictures into their scrapbooks! I do love to look at the photos they take. Many of them are out of focus and aren't exactly well-compositioned works of art, but they let me see how they view the world. Have you ever wondered what life looks like from 3 1/2 feet off of the ground? In the pictures they take of their father and I, we look like giants - lots of leg, small heads! I also get to see what is important to them. Obviously, they take lots of pictures of their toys, but then there are more unusual items, like the cup of milk on the table, or the computer keyboard, or the magnets on the refrigerator. I burst out laughing as I came across a picture that David took of Isaac using the potty! They pay attention to the little things that I just take for granted. Then there are the photos they take of each other. Every now and then they capture a moment of magic caught in this worldwind we call daily life. As we sorted through the photos today, there was a beautiful snapshot of Isaac peering out from behind my legs and another David took of Isaac and I snuggled up reading. It is good to see the world through their eyes, to remind myself that my vantage point isn't the only one in this household. It helps me recall what it was like to be a child when the world seem comprised of nothing but big people's legs! Their pictures force me to acknowledge the little things that often escape my attention. Items that seem inconsequential to me have so much value to them that they want to take a picture to keep forever. I also get to see how they view our family - the two giant people and then the ones at eye level. The number of pictures of each other far outnumber the ones of us! They are brothers and they love each other and that is wonderful to see. I am so lucky to get this glimpse into their lives. I hope they wil continue to enjoy taking photographs - I look forward to seeing how their take on the world changes as they get older.